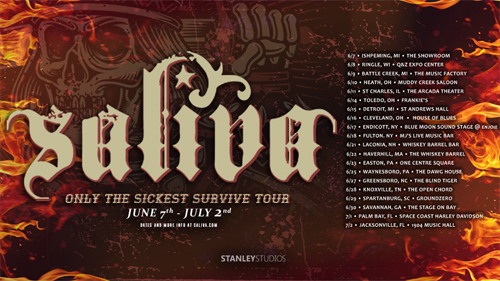 Multi-platinum and Grammy nominated hard rock group SALIVA announce headline dates for their summer Only The Sickest Survive tour. The first leg of the tour starts this week on June 7th in Ishpeming MI and hits cities East of the Mississippi. It ends on July 2nd in Jacksonville FL which is home base for members lead singer Bobby Amaru and bassist Brad Stewart - formerly of SHINEDOWN and FUEL. More dates are being added throughout the summer into October with further announcements coming.